Providing you the best range of silhouette blinds, roller blinds, monsoon blinds, venetian blinds, zebra blinds and panel blinds with effective & timely delivery. 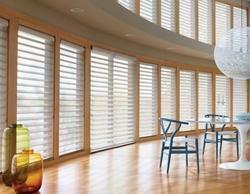 With the choice of 2", 3" and 4" vane choices, Silhouette window shadings transform the light in a room. Silhouette shadings have a unique construction with different fabric opacities that allow the customer to choose from transparent, semi-opaque or light-dimming fabrics. The Palette fabric-covered headrail gives a finished look to the shading. The EasyRise™ lifting system with continuous cord loop disperses the weight evenly across the shading, making even the largest shading easy to raise. Window Techs roller blinds are designed and manufactured to the highest standards both in terms of technology and in terms of blinds. Through their clear and straightforward design language, they blend discreetly into the modern environment. Both in the private living area, in the kitchen and bathroom, as well as in the contract area, Window Techs roller blinds offer functional and textile visual and sun protection. The choice of the blind is crucial for the degree of vision, eye and light protection. Thus, through different levels of transparency, structures, and colors individual effects and moods can be generated. In addition, function-oriented substances are suitable for use in wet rooms and in buildings. The superb quality Monsoon Blinds are especially designed to withstand tough weather conditions such as heavy rains, storms and heavy winds. We design our monsoon blinds from scratch resistant PVC and Acrylic fabrics and fittings are made from genuine stainless steel that provides robustness. 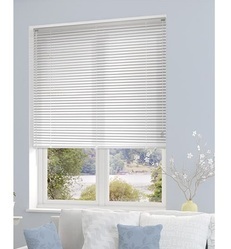 These blinds are easily installed and the operation is simpler too. Window Techs Venetian blinds are made of aluminum, making them robust and resistant. They are suitable for any room, for small windows and also for rooms with high humidity such as kitchens and bathrooms. On-screen workplaces, the blinds are particularly popular for glare-free illumination. 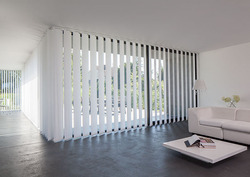 Horizontal blinds convey an objective light mood in the room. Its filigree appearance goes particularly well with straightforward architecture and a modern and minimalist style of furnishing. Different colors and surface structures also offer individual design options. 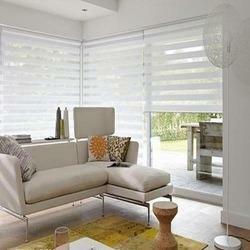 We have carved a niche in the market by offering best and unique quality array of Zebra Blinds. Zebra Blinds offered by us are very stylish and beautiful in design. They are put at the windows to keep the heat and light away. 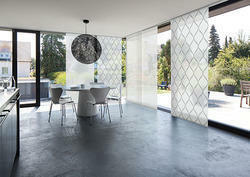 These blinds are available in pleated design too. The cost of these blinds is very cost effective and light. Window Techs panel blinds perfectly supplement reduced and puristic interior furnishings. They are particularly suitable for floor-to-ceiling windows and large window fronts, in order to dose the incidence of light there. This system can be equipped with a different number of panels, different panel widths, and various hanging variants, entirely in accordance with the individual planning and architectural conditions. The technical system consists of an aluminum rail in which the fabric panels are guided. Each individual fabric panel can be removed easily for replacement or cleaning thanks to hooking and loop tape technology. In this way, the widest variety of effects can be achieved with the most diverse fabric transparencies or coordinated colors. In addition to their functional properties, Window Techs panel blinds can decisively contribute to the overall stylistic statement of a room. 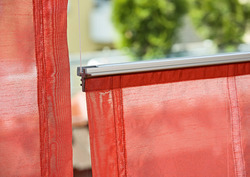 Window Techs Silhouette shadings feature soft adjustable fabric vanes that appear to be floating between two sheer fabric panels that beautifully diffuse harsh sunlight. Simply tilt the vanes to achieve your desired level of light and privacy. Window Techs Collection of Silhouette shadings are beautifully crafted from an exclusive selection of textured front sheers, metallic accented vanes and hardware finishes offering stylish innovations to elevate your home. We Are One Of The Well-Distinguished Companies For Manufacturing, Exporting, Wholesaling, Retailing, Trading, And Importing Of The Wide Assortment Of Wooden Blinds. We Are One Of The Well-Distinguished Companies For Manufacturing, Exporting, Wholesaling, Retailing, Trading, And Importing Of The Wide Assortment Of Roman Blinds. Window Techs pleated blinds offer the tailor-made solution for unusual window shapes and skylights because they adapt themselves perfectly everywhere. At the same time, Window Techs pleated blinds blend skilfully into the background and underline the visual effect of the hanging. In addition to free-hanging systems which are mounted in front of the window and beautify the entire window front, there is a taut system that is installed directly in the glazing bead in order to allow the unrestricted function of side-hung or bottom-hung windows. 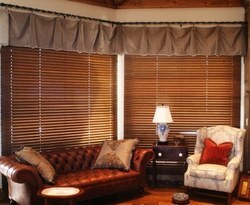 The perfect technology of the taut, freely movable Window Techs 11-8220 pleated blind particularly stands out here. The hanging can be adjusted individually from the top or bottom and is always right where you need it. The Window Techs pleated blind fabric qualities impress with their versatile performance and fulfill the demands of modern PC workstations and working environments in exemplary fashion. 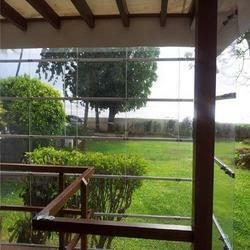 Weather blinds, designed to withstand heavy rains and gusty winds, without blocking the outside view. The intelligent use of transparent PVC fabric ensures the unblocked view and stainless steel guides and cables provide long-lasting support and life to your blinds. These blinds are recommended especially for open areas like balconies, food courts, rooftop cafeterias, garden restaurants, Alfresco dining areas, and similar open spaced settings. These blind are manually operated and are customized to fit perfectly. We Are One Of The Well-Distinguished Companies For Manufacturing, Exporting, Wholesaling, Retailing, Trading, And Importing Of The Wide Assortment Of Pleated Blinds. If efficient light modulation at the window is desired, Window Techs vertical blinds are the right choice when planning your project. Depending on the position of the sun, the operation of the hanging, which consists of individual slats, permits an optimum regulation of light and view. Thanks to Perlex or other functional coatings on the rear side of the slats, incident rays of light can be effectively reflected and thus offer outstanding privacy and glare protection in the modern world of communication and work and in particular at PC workstations. For sophisticated architecture, large window areas, doors, transom windows, many special shapes and as room partitions, they are the ideal solution when it comes to effective, purpose-orientated and aesthetic shading. In addition, accents, contrasts or color graduations can be skilfully conceived with the individual slats - to suit the respective style of the room. Window Techs vertical blinds adjust the lighting conditions in the finest graduations depending on the desired depth of effect and are particularly flexible in use.